You can now pay your Ronald Wastewater District bill without getting out of the car. 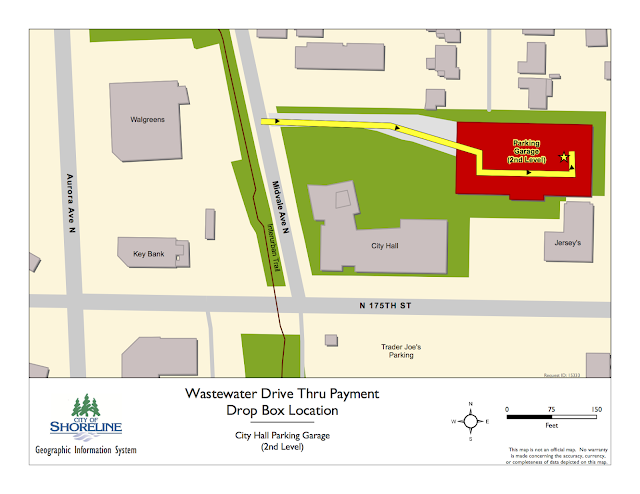 Shoreline residents who prefer to drop off their payments can now access the drop box from their car window. The box is still on the upper level of the City of Shoreline parking garage, but it has been moved to the east end and set up as a drive thru. The payment box was moved to City Hall when the city assumed most of the operation of the district. The Ronald Wastewater District Board of Commissioners continue to be responsible for addressing policy matters, setting rates, and managing capital improvements for the utility. You can still report customer service issues using the District’s old phone number 206-546-2494. All utility business conducted in person, including paying a bill, using the payment drop box, addressing a customer service issue, or receiving a permit will now be conducted at Shoreline City Hall 17500 Midvale Avenue N.